ooVoo, a competitor to Skype recently launched a new version of their software. 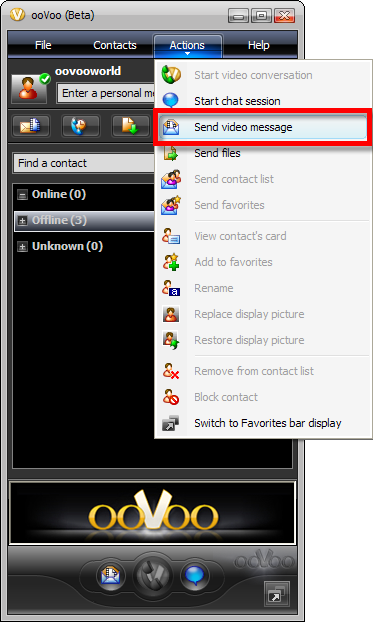 The current version allows video conferencing with up to six participants, while Skype only supports two-party video calls. Even cooler, the new version adds video recording, which you can save as an .AVI file. Skype doesn't let you record the video unless you use third-party programs. I should point out that SightSpeed has provided video call recording for quite some time now. Check out my SightSpeed review from awhile back. The new 1.5 version of ooVoo also adds visual effects and the ability to make U.S. phone calls (PSTN). As part of their promotion from February 4 to March 1, 2008, users who download ooVoo 1.5 will get two hours of calling for free. Hat tip to Joanna Stern over at LAPTOP Mag. She emailed me to tell her about her first take on the just released software. That was fast Joanna! Go check out her nice quick review of the new version of ooVoo. How Skype Changed the World! \nI should point out that SightSpeed has provided video call recording for quite some time now. Check out my SightSpeed review from awhile back. \nThe new 1.5 version of ooVoo also adds visual effects and the ability to make U.S. phone calls (PSTN). As part of their promotion from February 4 to March 1, 2008, users who download ooVoo 1.5 will get two hours of calling for free. \nHat tip to Joanna Stern over at LAPTOP Mag. She emailed me to tell her about her first take on the just released software. That was fast Joanna! Go check out her nice quick review of the new version of ooVoo.